Android Wear big boss David Singleton just showed a demo of Android Wear 2.0 at Google I/O. And man, is the new software full of good ideas. Google is improving what smartwatches already do fundamentally well: fitness tracking and notifications. Now, watch faces will display notifications and information from any Android Wear app, much like Apple Watch’s own watchface complications. That certainly helps if you want a watch that’s basically an at-a-glance notifications ticker on your arm. But Google is also trying to make smartwatches a platform that does more than just tell you what is happening in the world. It wants you to also respond to that information. That’s why it’s developing three new ways for messaging on Android Wear: smart replies, handwriting, and a swipe keyboard. A 1.5-inch display is still far from any kind of display I’d want to try to communicate on for than five seconds, but at least Google is experimenting. On the fitness front, Android Wear 2.0 takes the “personal coach” approach. Google-powered smartwatches will soon come armed with automatic activity recognition—a feature long present on Fitbit wearables—and will funnel health information with the Google Fit API. “So information like calories consumed in a nutrition app can sync with calories burned in a running app,” Singleton said. With the help of automatic activity recognition, certain apps will automatically start tracking activit,y when it notices a specific behavior. Singleton used the running app Strava as an example, which lets you launch Spotify directly from the Strava interface even without a phone. And phoneless Spotify is quickly becoming a must-have feature for any wearable. This is a big step toward Singleton’s vision, expressed in an interview earlier this year, of a smartwatch’s role in automatically recognizing the world around you. But for most, it’s still not a convincing argument to stick a computer on your wrist. 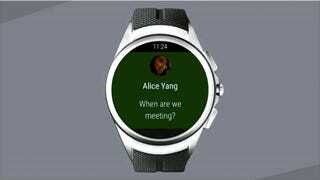 Once Google imports its new Google Assistant intelligence to its watches, then Android Wear might be onto something.